What I've set up so far is a bit hackish, I'm checking whether the point is inside the bounding rectangle first to drop out the most obvious cases. Next, I'm checking whether it's inside the rectangle formed by the points ACDF, another easy check. Now the hard part is that I need to check whether the point is inside the triangles. That's pretty straightforward if you have the barycentric coordinates, but I seem to have lost all the knowledge of how to obtain them. 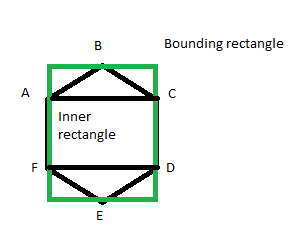 Do take into account that while the inner rectangle is always a rectangle, the triangles might not be equal-sided. Bonus points if there's an optimization to be made because the bottom (or top, respectively) of the triangle is flat. So in your top triangle A.x would correspond to x1, A.y to y1 and so forth. Plugging in the values in the formulae will yield the lamdas which are your barycentric coordinates. If they are all positive then the point is obviously inside the triangle. If your goal is only to do point-in-hex tests (and you don't actually need the barycentric coordinates themselves), then your problem becomes much easier; you can simply look at the equations of your line segments and find the intercepts with the horizontal span containing your test point, then check whether it falls between the two ends. Not the answer you're looking for? Browse other questions tagged mathematics coordinates barycentric-coordinates or ask your own question. Is it really necessary to test collisions against triangle vertices and edges?